CMS or Content Management System is considered to be the most sought-after tool used by web developers across the globe for developing websites. There is a list of CMS platforms available in the market, which enable web developers to build websites easily and with less turn-around time. However, to choose the right one, best suiting your requirements, from innumerable number of CMSs available in the market can be a tough job. 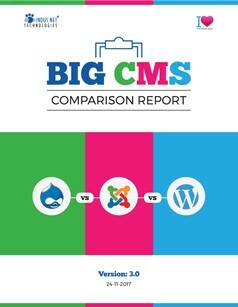 “The Big CMS Comparison Report, Version 3.0” is a whitepaper from Indus Net Technologies, prepared on the basis of our vast array of experience, which provides an in-depth comparative analysis & guide for selection among the top three most popular CMSs – Drupal, Joomla! and WordPress.